Eat, Drink, Man, Woman is a warmly rendered tale of single father and three grown daughters living together in a charming Taipei home. The father is Master Chef Chu, master chef of Taipei’s famous Grand Hotel. Being a widow is not Chef Chu’s only loss; he has also lost his sense of taste and the bitterness of his empty palette has spread throughout the household. There are really four stories here, seamlessly blended into a delicious film meal. Director Ang Lee succeeds in recreating the world in which the Chu family lives and effortlessly involves us in their stories. The use of food preparation and presentation is a mouth-watering spectacle in itself. 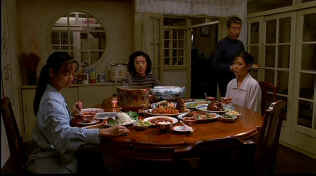 The film opens on Chef Chu’s methodical preparation of the family’s Sunday dinner. Don’t, absolutely do not think of seeing this movie on an empty stomach. The array of exquisite dishes presented for his three daughters by Chu is delightfully obsessive. Ang Lee has a grand eye for color. The film’s bright lighting scheme enhances the colorful presentations. Lee’s compositions, on plate or in film frame are equally pleasing. There is a great helping of humor mixed in as the family tries to sort out their various problems. The actors are all equally pleasant to spend time around. Sihung Lung is terrific as the master chef with the missing taste buds. When we’re not looking at beautiful food, we can delight in the beauty of the three daughters. They make a natural acting ensemble, relating to each other with authentic sibling energy. Characters authenticity makes Eat, Drink, Man, Woman a rich, wonderfully prepared entertainment. The score embellishes the themes with a delicate leitmotif. Production design has a wonderful splattering of color is every scene adding to the visual splendor of Eat Drink Man Woman. Locations for Eat, Drink, Man, Woman add a pretty wrapping for the core material. Jong Lin delivers the glossy photography chosen by Lee with flawless perfection. The DVD is a blaze of beauty, from red peppers to jumbo pink prawn. The excitement jumps off the screen with outstanding light output and robust contrast ratio. Good deep blacks and fine shadow detail. The Grand Hotel is a majestic sight against the night sky. The entrance is simply breathtaking. Food preparation is astoundingly beautiful both in color saturation and resolution. Dig those candy stripe uniforms at Wendy's. The very sharp transfer delivers beautifully rendered background details. You have to hunt down the slight hint of high peak transition ringing. White English subtitles on the image are removable. The titles sit almost a third of the way into the picture and block more image than necessary. The visual feast is accompanied by a clean, open, Dolby Digital 2 channel matrixed surround sound. A fourteen minute short featuring an interview with Ang Lee. The lovely transfer of Eat, Drink, Man, Woman provides an unqualified delightful video repast. Mangia!